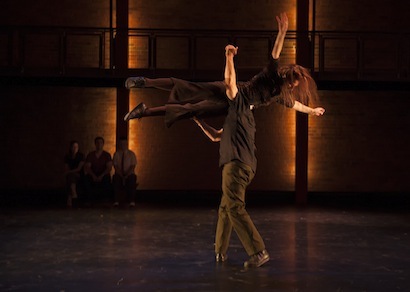 Exciting new dance transforms University of Guelph’s University Centre Courtyard. Leaving the framework of the stage and traditional audience/performer roles, X-ODUS pushes all boundaries. To arrive, one has to leave. Departing has never been so sweet. Weaving intimacy with flight both aerial and inter-personal, I feel the worlds of tender interruptions uncover pathways and connections between the dancers as they struggle to find intimacy, distracted connections, vulnerability and depth in their fragile and explosive journeys. Kaeja d’Dance. Photo by Ken Ewen.